You are welcome to give it out as many times as you like, but it is only to be given to a maximum of one person per blog post. If you wish to give multiple rewards, please space the blog posts so the sincerity is maintained. Introduce the person; say how they encourage, help or inspire you; then link to their work and/or social media profiles. There may be a specific post you wish to link to which helped you. It’s up to you. 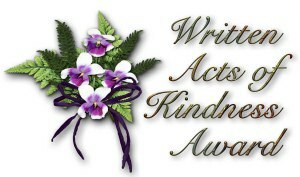 Please publicise your award post to Twitter or Google Plus using the hashtag #writtenkindness so that others can find and follow the award winners. This award is open to anyone to use. You don’t have to receive it, in order to be able to give it. Once you have received it, it isn’t obligatory that you must pass it on. The lovely Jo Robinson is a recipient of the Written Acts of Kindness Award from M’lud Seumas Gallacher and richly deserved. I must second Seumas Gallacher on this one. Jo is a truly talented writer of fiction and a blogger with helpful posts, a real team player in the indie community. Check out her blog and books. Another one of my favourite bloggers and writers. A very worthy winner, Seumas.